In the last six months I have been spending significant amounts of my free time learning about the Landsat program and how to access and analyze their 40-year archive of data, which is now freely available. 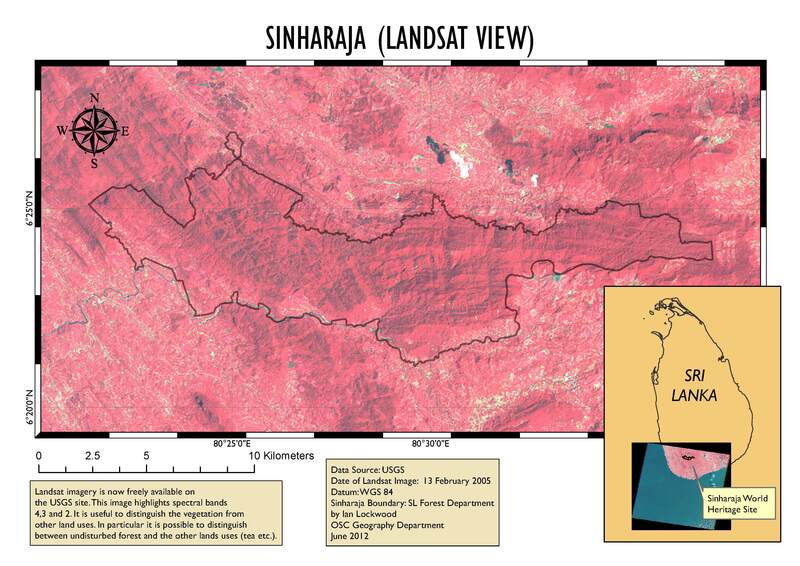 I was initially motivated by several mosaics of remote sensing imagery that I saw at ATREE’s Ecoinformatics lab, the IWMI GIS lab and MIRSAC in Aizawl. Then earlier in the year I was gifted a copy of Remote Sensing for Ecology and Conservation through a program run by the Natural History Book Shop (NHBS) in London. The book is the result of collaboration between NASA and members of the Center for Biodiversity & Conservation at the American Museum of Natural History. It gives a very thorough overview of using satellite imagery in aid of conservation goals and has proven to be an indispensible aid in helping me understand the uses and applications of remote sensing. My interest is in applying the data and analytical techniques in areas of the Western Ghats and Sri Lanka that I have worked in, photographed, written about and taken students to. In July the Landsat program celebrated 40 years of earth observation and analysis. They have made almost the entire archive of spatial data available to the public through the USGS Glovis site. 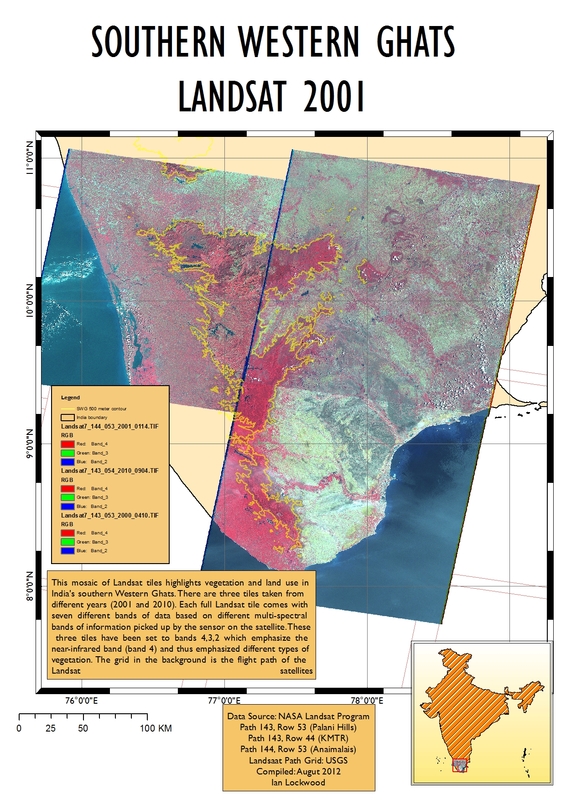 I have started downloading some of the tiles with the goal of looking at temporal changes in vegetation and land use in areas in the southern Western Ghats and Sri Lanka. One approach is to use a photo editing software package (Adobe Photoshop etc.) to analyze the images but I have been interested in GIS and analytical applications of the imagery. Since most of my work with GIS is based on ESRI’s Arc platform of software it seemed sensible to use Arc Map and the Spatial Analysis extension to work with the imagery. However, if you are just starting off there are now freeware options available in software such as Q-GIS. The Indian government has made archival remote sensing imagery, including multi-spectral files, available on its Bhuvan site. I have not yet had time to explore these options and have been focused on trying to learn how to import, mosaic and analyze the NASA Landsat data through ESRI’s software. For educators, curious people and novices such as myself the internet has provided an easy way to access and learn how to use and analyze remote sensing data. There is a wealth of online tutorial information available for using the Landsat archive. NASA, of course, has numerous links and a good place to start is the Landsat homepage. There are also other data portals such as ArcGIS Online, the University of Maryland’s Global Land Cover Facility and USGS’s Earth Resources Observation & Science (EROS). I am regularly updating my GIS Links page on my Mangotree teaching Wikisite with links to tutorials etc. on remote sensing, Landsat etc. This Image of the High Range, Anaimalais and Palani Hills was taken by Landsat 1 in July 1973. Water bodies such as the Vaigai dam and larger reservoirs in the High Range and Anaimalais are prominent. Overall levels of vegetation are generally high presumably because of the onset of the South West Monsoon in the previous month. 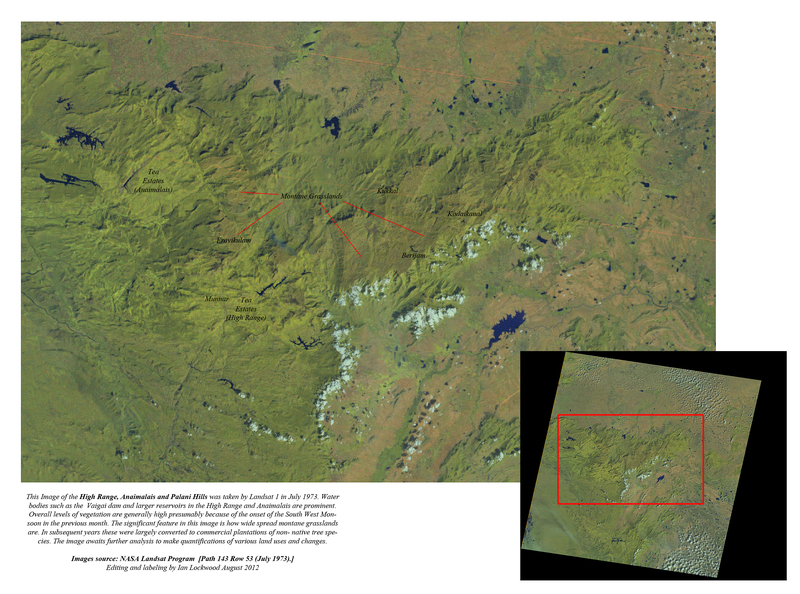 The significant feature in this image is how wide spread montane grasslands are! In subsequent years these were largely converted to commercial plantations of non- native tree species. The image awaits further analysis to make quantifications of various land uses and changes. As aspect of the Landsat archive that fascinates me is the opportunity to do temporal studies of changes in land use in areas that I have first hand knowledge of. As is well documented, significant changes have happened in the land use in critical areas in the Western Ghats and Sri Lanka biodiversity hotspot in the last 40 years. Forest loss is perhaps what first comes to mind. But perhaps more difficult to track has been the change of forest cover or vegetation type. For example large swathes of high-altitude grasslands were converted in the 1970s and 1980s to fuelwood plantations of monoculture species. Eventually we should be able to do detailed studies of vegetation changes in critical hill ranges such as the Nilgiris, Palanis, Anaimalais and High Range using some of the tools that are available on modern GIS software. Sinharaja Rainforest Landsat view highlighting the thermal band and closed canopy evergreen rainforest within its boundaries.